The Castle Hill Community Association, along with local MTB clothing manufacturer Ground Effect and single-track specialists T5 Contracting, have been active in developing a network of dual-use mountain biking & tramping tracks in the Castle Hill Basin area now known as the Craigieburn Trails. To date this development has included the construction of the Hogs Back and Sidle 73 tracks, the upgrade/reroute of the Dracophyllum Flat track, and the construction of the Coal Pit Spur track. These four tracks constitute the Craigieburn Trail, 24km of single-track with a couple of short linking sections of ski-field road from Flock Hill to Castle Hill. These tracks add to the existing trail network within the Craigieburn Forest and Korowai/Torlesse Tussocklands Parks, and are mostly graded as intermediate mountain-bike standard. We have more ideas for track development in the Castle Hill Basin and will be continuing to work with DoC on bringing those ideas to life. Geotech kindly donated excavator-time for use on some of the gnarly bits of the original Hogs Back Track development. We received $2,000 in TrailFund‘s April 2014 funding round. Local clothing and outdoor equipment manufacturer Cactus Outdoor have kindly supported our Spring 2014 workparty by donating spot prizes for a couple of lucky volunteers. Cactus produce exceptionally hard-wearing gear locally in NZ, and more than a few of the Craigieburn Trails team are already fans of their clothing; between us, our Cactus trousers have quite a few hours over the last few years contributed to track building on the network. Ground Effect Cycle Clothing have been a great supporter of the Craigieburn Trails since the outset, even spending a couple of their company Xmas days out working on trail building (one of which produced the “Ground Effect switches” north of Picnic Rock on the Hogs Back Track). Ground Effect were also heavily involved in the development of the Sidle 73 track and the re-route south of Cheeseman’s Forest Lodge. Big ups to the Fonterra Grass Roots Fund for granting the Castle Hill Village Craigieburn Trails project a generous $5000 to go towards completion of the Coal Pit Spur Track! We started the Craigieburn Trails journey with the Department of Conservation a long time ago, and along the way they’ve provided endless advice and in-kind support for the Castle Hill Community Association including, but not limited to, supplying technical staff for design (structures, etc) and mitigation of environmental effects, trailhead signposting, etc. We continue to have a great relationship with DoC staff, now formalised under a Memorandum of Understanding between DoC & CHCA that underpins the future track development we hope to undertake. Spoke Magazine sent a few people our way for our Winter 2014 Numberplate Surround fundraiser – go and buy a copy of their fabulous mag and say thanks from us! Sylvia & Garth from Trax-NZ put in a huge amount of collaborative effort to produce the beautifully crafted Craigieburn Trails “microfibre map”, which helps ensure riders can find their way on the ground, and also provides much needed fundraising for our trail maintenance and development coffers. 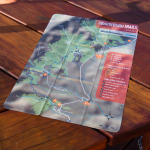 Getting your map direct from us here will maximise the fundraising benefit to the Craigieburn Trails. A generous $20,000 towards the overall development of the combined tracks from Castle Hill Village to Flock Hill.